Many years ago while flipping through one of the few cookbooks I owned at the time, I came across this recipe and decided on a whim to give it a try. What turned out to be just playing around in the kitchen turned into a yearly Christmas cookie tradition. It’s the Mr’s favorite cookie, so it’s a must. I change up a lot of recipes each year but a few select ones are traditions for one reason or another. This is one of them. It has to be made because it’s special. It’s light while offering the nicest fruity flavor, not over powering at all. 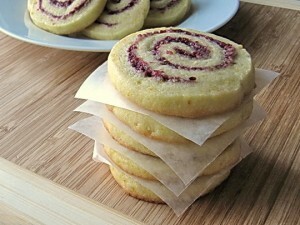 As you might recall, I recently shared a recipe for cranberry swirl cookies. These two cookies have a lot of similarities, very obviously ones even. 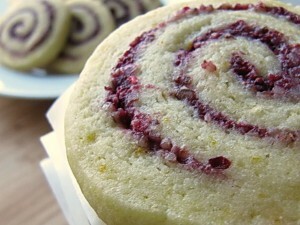 They both are pinwheel cookies and both have a cranberry filling. The big difference is the overall flavor. 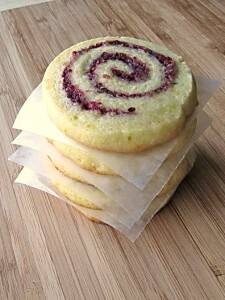 The cranberry swirl cookie has a cinnamon cookie with a very tart sweetened fruit filling. The cran-orange cookies are airy, have just the right amount of orange flavor and are then filled with a barely sweetened cranberry nut mixture. With these, you don’t get the strong cranberry punch. Even though I loved the cranberry swirl cookies, because I’m obsessed with cranberries … juice, fruit, craisins and in all kinds of different recipes… this recipe would be perfect for anyone who maybe isn’t quite as obsessed with cranberries as I am. They’re well loved and I promise, as with many other recipes I’ve shared – it will be a crowd favorite. It’s almost a nice palate cleanser. Don’t be scared away by the design of the cookie. It’s really quite simple. The dough is extremely easy to work with as is the filling. Perhaps you have some leftover pecans from Thanksgiving or a bag of cranberries you’re wondering what to do with… this would be a perfect ingredient to use up both. These are great for gifting, bringing to the office or a holiday party. Enjoy! Yield: Full recipe will make 2 logs and roughly 4 dozen cookies. Halve the recipe for a more manageable amount or simply freeze one log for later. In a food processor, add cranberries, pecans and brown sugar. Blend until evenly chopped. If you don't have a food process you can try using a blender or simply chop the cranberries and pecans by hand, then mix well in medium bowl. Transfer mixture to a small bowl, set aside. In a large bowl or stand mixer whip butter until light and creamy. Add sugar, baking powder and salt. Mix just until combined. Scrape sides of bowl as needed. Using a zester, remove 2 teaspoons of outer skin from one orange. Basically grate/zest the entire orange and then measure out what you need. I halved my overall recipe only making one log but still chose to use a full 2 teaspoons of orange zest giving the cookies a stronger but still delightful taste. Either way is fine. Remember to not zest too deep. You don't want to get down to the white beneath the tough of the skin. Add orange zest and eggs to wet mixture. Beat just until combined. Scrape sides of bowl. Begin slowly adding in the flour, one large spoonful at a time. Mix until all ingredients are encorporated well into the dough. Transfer mixture to a medium bowl, cover with plastic wrap and chill for at least one hour. When the hour is up and you're ready to continue: you'll need a rolling pin, dough, filling, a spoon or rubber spatula, wax paper and tape. Bring all supplies to your work station. Cut two equal pieces of wax paper at least a foot wide. 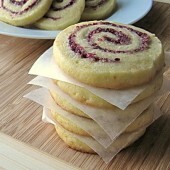 Plop dough onto one sheet of wax paper. Form dough into a disc, then place the second sheet of wax paper ontop. Begin rolling dough into a large rectangle, roughly 10" wide. Spoon filling onto the center of the rolled out dough. Gently spread cranberry pecan mixture over entire dough, just up to about a half of an inch from the edges. Cut an additional sheet of wax paper, set aside. Begin rolling your dough starting at one of the shorter ends. I like to use the wax paper to help roll the dough, gently pull up and gravity will help to some degree. When you get closer to the other end, place your new sheet of wax paper underneath where it will roll. Wrap dough and secure with tape. Now here's the weird trick you may think I'm crazy for doing but this trick will prevent your cookies from having one flat side while the rest is rounded. Place dough within two large cups. The inside is rounded so it'll help keep your dough from settling into a flat spot like it would if you let it sit in the fridge without a rounded surface. Transfer dough with glasses to the fridge to chill for at least 24 hours. The original recipes states 4 hours but I prefer to chill overnight giving a more solid result, which is better for slicing and baking. After the first several hours I like to carefully remove the log from the glasses, gently shape more as needed while still wrapped in wax paper. Then return to the glasses. Occasionally I'll roll the glasses throughout the 24 hour period so a different part of the log is on the bottom. I'm obsessive but it works. You don't have to do this if you don't want. At this point if you wish to freeze one log, do so while wrapped. Transfer wrapped log to a large sealable plastic bag labeled with the type of dough, and any further instructions such as cook temp and time. Preheat oven to 375. Prep baking sheets with parchment paper or a silpat. Remove dough log, slice into 1/4 inch pieces. Place 1-2 inches apart. I was easily able to fit 12 pieces onto one sheet without any issues. Bake for 8-10 minutes or just until the very bottom edges are showing the slightest golden color. Let cookies sit on tray for 2-4 minutes before carefully transfering to a cooling rack to cool completely. Store in an airtight container for up to a week...if they last that long.